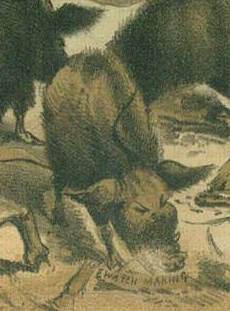 In the winter of 1885 and the following summer of 1886, the Chinese were driven out of the Northwest Territories, in what is now Washington and Oregon State. After the Gold Rush, many of the Chinese driven out of California moved upwards into the Northern territory. A violent outbreak in the mining town of Rock Springs, Wyoming occurred on Sept. 2, 1885. See Here’s a Pretty Mess! (in Wyoming). In Seattle, Chinese found mining and railroad work. As in Wyoming, the Knights of Labor, an organization with a large Catholic membership were visible actors arguing for an eight-hour work day. 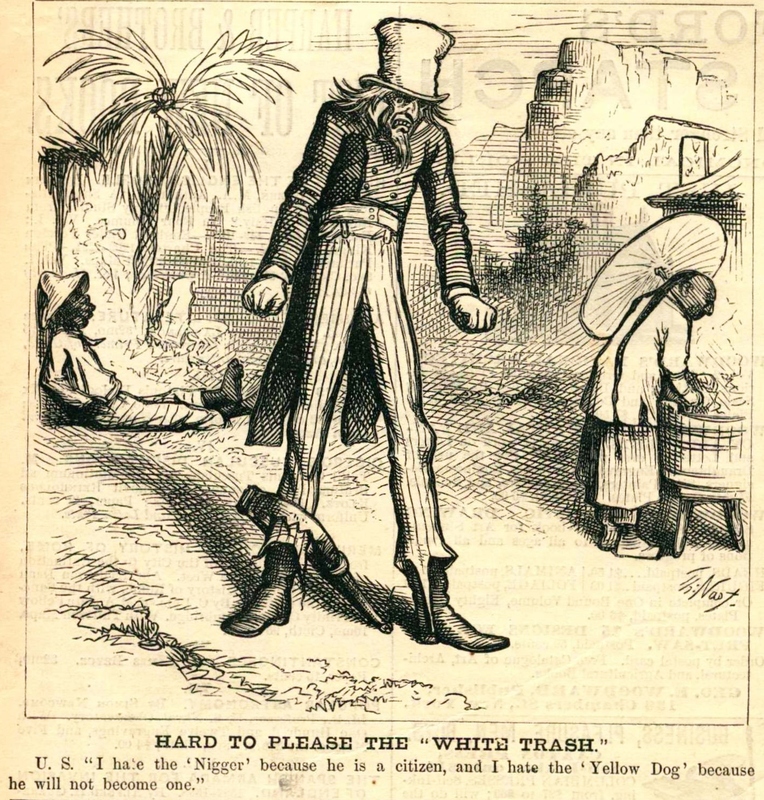 To their credit, they called for an end to child and prison labor exploitation, but they were no friend of the Chinese, a race of people the Knights of Labor deemed inferior, and whose willingness to work at a reduced rate was regarded as unfair competition toward white labor interests. Venture capitalists in the mining and railroad knew exactly what they were doing when they recruited the hard-working Chinese to work for less. The employers cared little about the reaction of organized labor. It is less clear how fully aware the Chinese as pawns to be manipulated by management to break labor union demands. As in many other industrial towns, mob-pressure ultimately broke out against Chinese labor, and the frustrations found release through mob violence. White workers demanded the Chinese leave. Many Chinese fled to the Portland area where they were welcomed and fit in with the foreign trade atmosphere of the city. 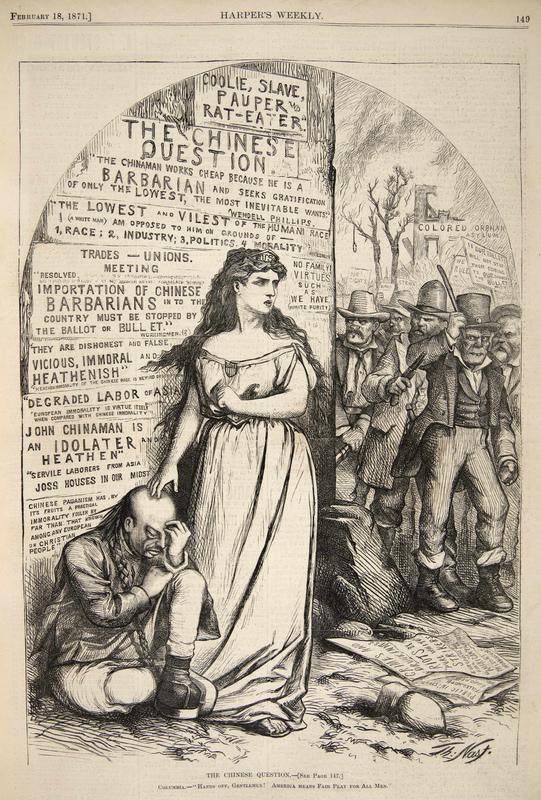 Nast’s second to the last cartoon on the Chinese was drawn four years after the passage of the Chinese Exclusion Act. Eleven years elapsed since he brought Columbia or her any of her relatives (here in the form of Lady Justice) out of retirement to stand strong on behalf of the Chinese. 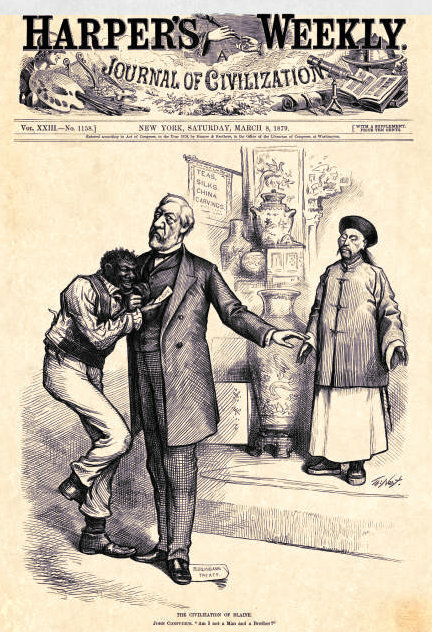 Denis Kearney and his white labor cohorts achieved their goal, but the passage of the Chinese Exclusion Act failed to satiate their fear and mob activities against the Chinese persisted. They wanted all Chinese out, even those few Chinese who met the legal requirements to remain in the U.S. 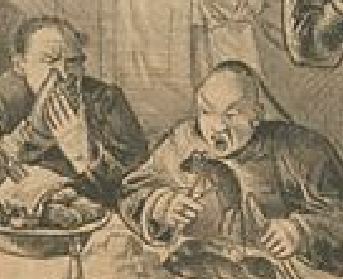 In the cartoon, Chinese men lay prostrate on the ground from recent violence. On the right, structures smolder in the distance. In her right hand, Lady Justice heaves a large sword as white workers on the ground notice her interrupting presence and begin to leave. The weighing pans of Lady Justice’s scales are incomplete. One of her pans is missing. 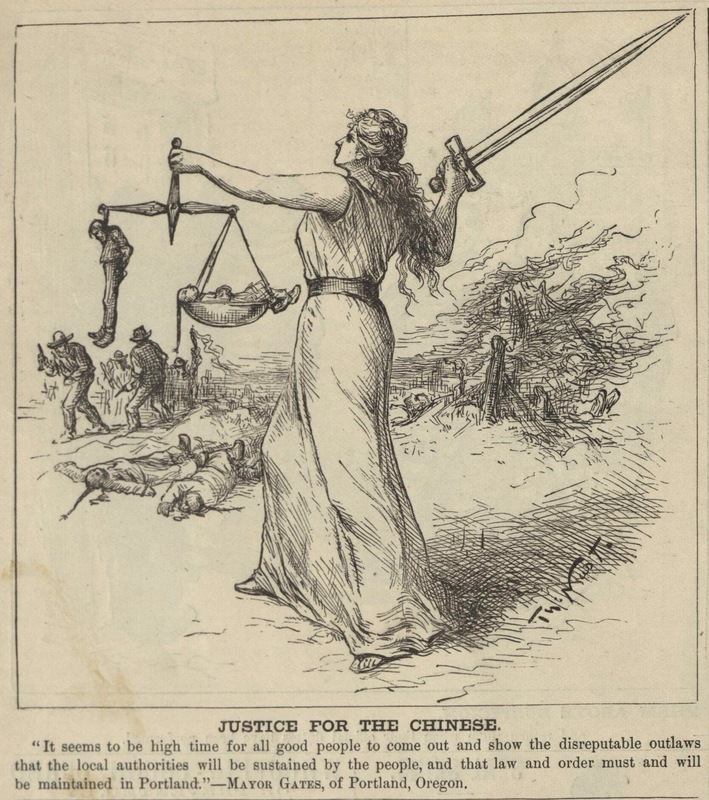 From this end of the scale, a white man dangles from the neck as if lynched or hung in order to compensate for the death of the Chinese victim. The dead Chinese figure is cradled upon a bowl-shaped container. His queue hangs over the edge. His hands rest on his chest as if posed in death. The arms of the scales, however, are in balance. Justice has brought her incomplete measuring instrument to the violent scene and weighed each victim despite the missing component. There are no other obvious white victims. Her broken scales signal that the Justice system is broken and has failed the Chinese workers. Despite her faulty scales, Nast’s Lady Justice balances the scale with a white victim. The white man obviously weighs more, yet the atrocities are equal in her eyes. Did Lady Justice scoop up a white perpetrator in a biblical “eye for an eye” moment, exacting justice despite a broken instrument? Has she turned the tables on the white workers, adapting their tactics of lynching to send her message? Celebrating Thanksgiving: two coasts – two interpretations! 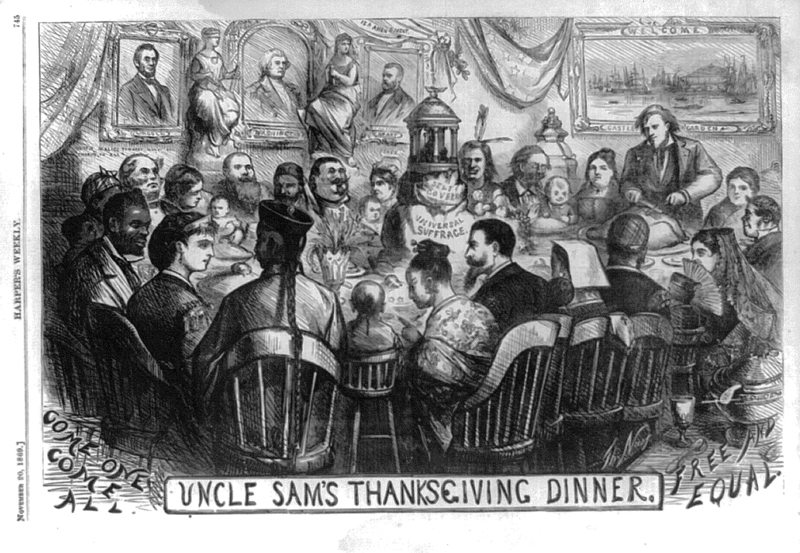 In 1863, Lincoln proclaimed that Thanksgiving would be celebrated on the fourth Thursday in November. However, the Civil War interrupted national observance of the holiday as southern resentment lingered, preventing old Lincoln adversaries from fully accepting the proclamation. 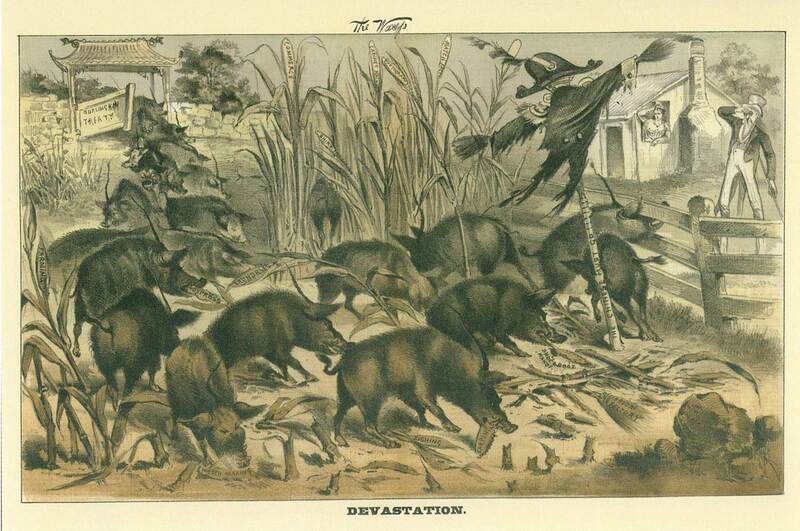 Nast’s Thanksgiving illustration was published one year before it became a national holiday in widespread practice. 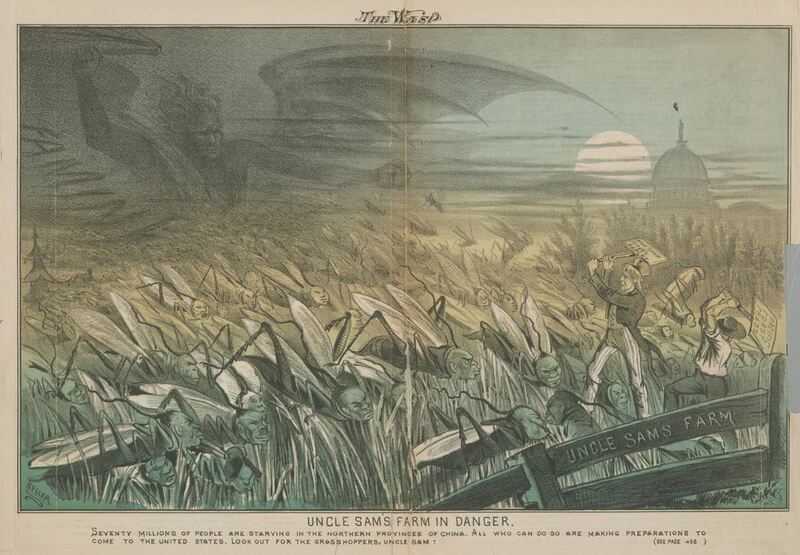 Thomas Nast drew Something That Will Not Blow Over, a double-paged illustration in Harper’s Weekly, in direct response to the Orangemen’s Riots of July 1871. It features a large central drawing, with various smaller vignettes surrounding the main picture. 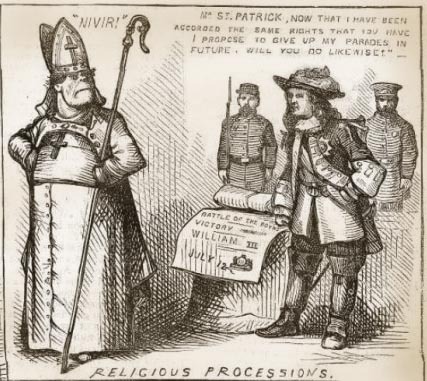 In the mid to late nineteenth century, for the Protestant ruling class in New York City, percieved “Irish” and “Catholics as synonymous terms. Irish meant Catholic and Catholic meant Irish. Italians and eastern European Catholics also arrived in New York, but were not as visually prominent as the Irish. German immigrants, the second largest immigrant group, tended to reside alongside other Germans from the same region. German Catholics worshiped separately from Irish Catholics, and had their own Catholic churches and communities (Nadel, 29, 37-39). At first, the Nast family did not live near the largest German community, Little Germany or kleindeutschland, located on the Lower East Side of Manhattan, but resided further west on Greenwich Street. Bavarian immigrants were scattered across several wards in New York (Nadel 37). Later the Nast family moved to William Street in the Fourth Ward, closer in proximity to the Sixth Ward that included a large Irish constituency. Irish American historian Timothy Meagher asserts that the Irish often tangled with Germans, and anyone they saw as competitors (223). Nast’s attacks against Catholics may have grown from this experience, but more likely formed from his observations of the Irish and their political positions. As his biorgrapher Paine suggests, Nast appears to single out the Irish “for the reason that a large percentage of the foreign immigration–an important political factor–professed that creed” (Paine 150). Tweed was the thread that wove many Irish and Catholics together in what Republican Protestants viewed as one neat, corrupt package. For Nast, the Orangemen’s riots of July 11-12, 1871 confirmed the violent Irish stereotypes that his German culture and neighborhood may well have believed and pre-disposed him to adopt. 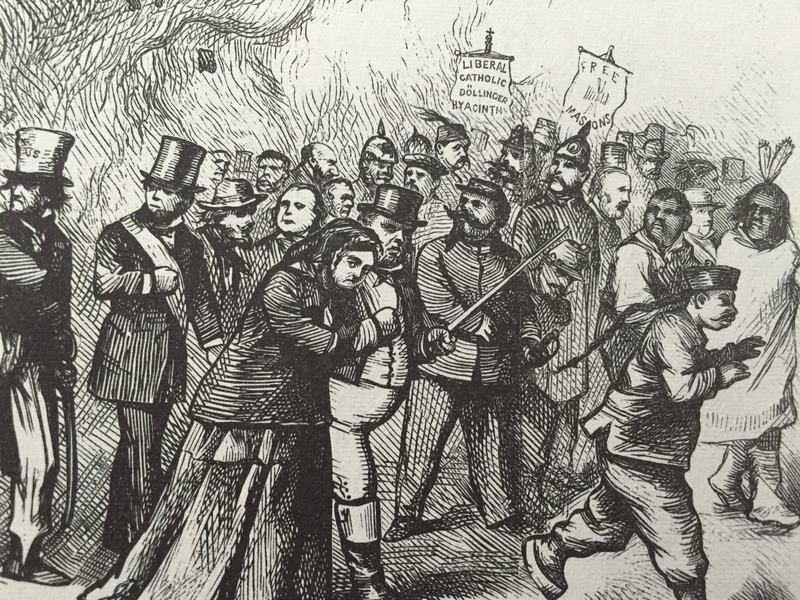 The 1871 street riots provided Nast with the excuse to not reprise his 1863 draft riot imagery, but strongly reinvent or embellish it. For several years, Irish Catholics in New York City celebrated St. Patrick’s Day with an annual parade. New York City’s Protestant Irish, calling themselves “Orangemen” — members of the Loyal Order of Orange named in honor of British King William III, Prince of Orange. William III had defeated a Catholic James II for dominion over Ireland, wanted an equivalent celebration. The Protestant Irish insisted their own parade to celebrate their own history. In 1870, they had gotten their wish, a parade of Protestant Orangemen-Irish. This first parade resulted in mild disturbances — and future Orangemen parade permits were banned. 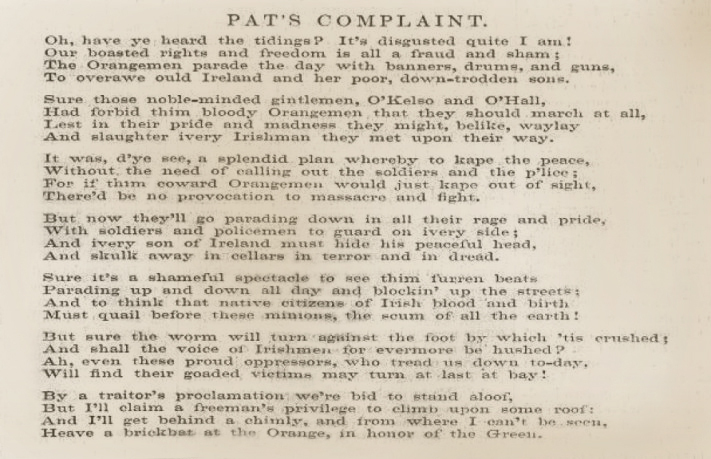 Nevertheless the Orangemen petitioned for another public celebration for the summer of 1871. A permit was extended. Irish Catholics were outraged. Tweed succumbed to his constituents’ demands and ordered Mayor A. Oakley Hall to retract the permit for the Orangemen to celebrate. The vacillation of official approval only proved to stoke Orangemen’s desire to exert their rights. 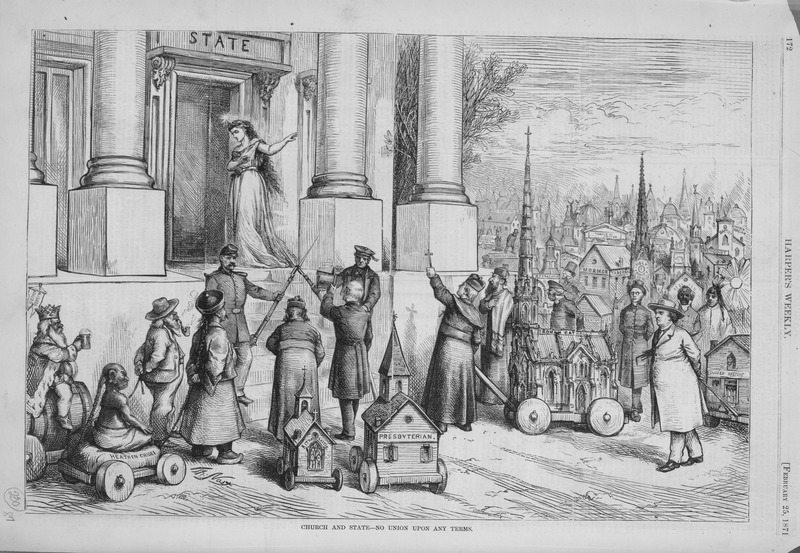 After Protestant outcry and pressure, Governor Hoffman issued Order 57, allowing the Orangemen to publicly march in the streets of New York City. The July parade would go on, and like its predecessor a year prior, the parade was not a peaceful assembly. Several hundred Irish Catholics heckled the paraders and disrupted the procession, hurling bricks, stones, clubs, and shot at women and children waving to the parade from their homes. The violence escalated to murder. Referring to the incident as the Tammany Riots, Harper’s reported that two soldiers and one policeman with Irish surnames protected the parade participants and were killed along with 44 civilians. But the New York media could not help but fixate on the apparent hypocrisy that Irish Catholics could have a parade, but Protestants could not. Along with the 46 fatalities, anadditional 26 police and soldiers and 67 civilians were wounded (Harper’s July 29, 1871 p. 564). 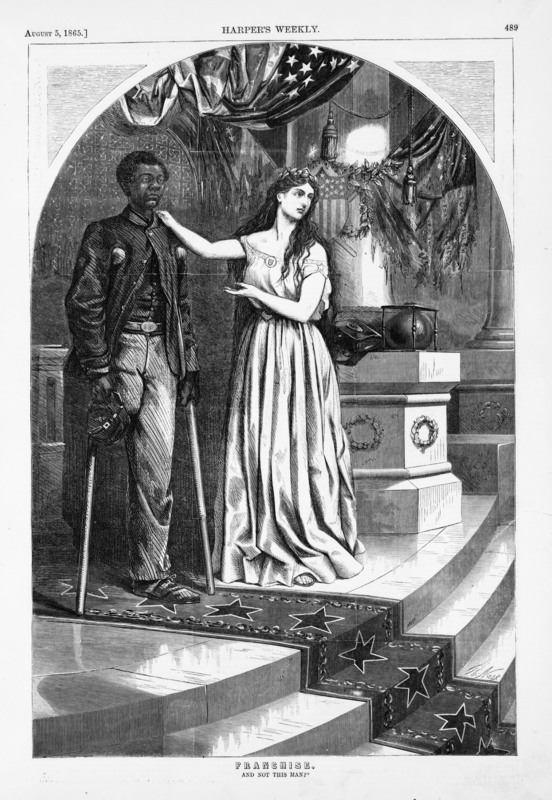 Nast relied on his arsenal of elaborate visual commentary and symbols to convey the layers of complexity and political maneuvering that surrounded the incident Like his Emancipation drawing of African Americans in 1864, Nast used a montage to depict the ancillary events that culminated in the central image. 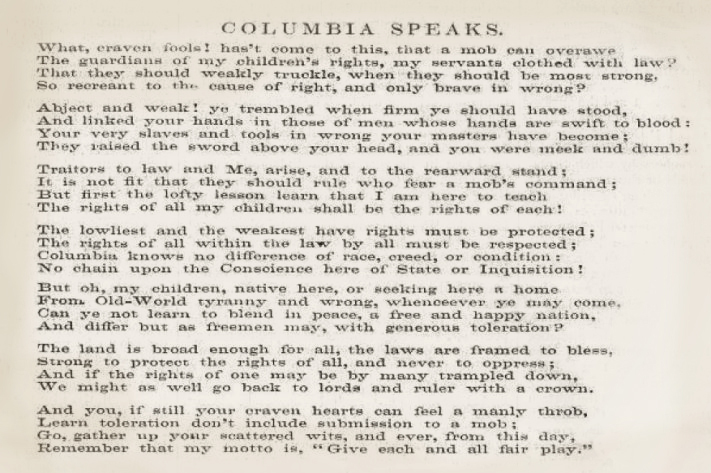 On important occasions or events of conflict, such as this riot, Nast called upon the imagery of Columbia as America’s advocate of fair play, morality, and when appropriate, admonition to wrong doers. As an Irish Protestant-Catholic conflict. racial prejudice were did not contribute to the Orangemen’s riots. Religious, not racial tensions were involved in the argument or the violence that ensued. 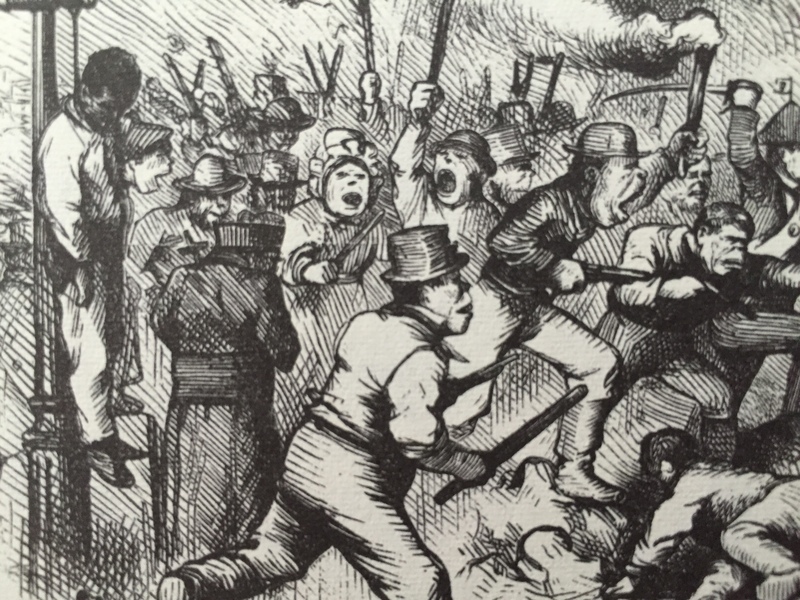 Nevertheless, Nast resurrected the images of the 1863 draft riot lynching and violence as the central ingredient in which to examine a completely different incident. Nast’s 1871 revision hardly resembled his original eyewitness account of 1863, where he is ambiguous about Irish involvement on Clarkson Street, a scene of racial lynching in 1863. By linking the Orangemen’s riots to the draft riots, Nast loses the ambiguity of Irish and Catholic involvement in the public violence. In the eight years that elapsed, Nast’s views against Irish Catholics changed and intensified. Something That Will Not Blow Over is a strong condemnation of the Irish and the Catholic religious hierarchy whom Nast viewed as meddlesome instigators. What had changed in the transpiring eight years that led Nast to strongly implicate Irish Catholics? Politics. 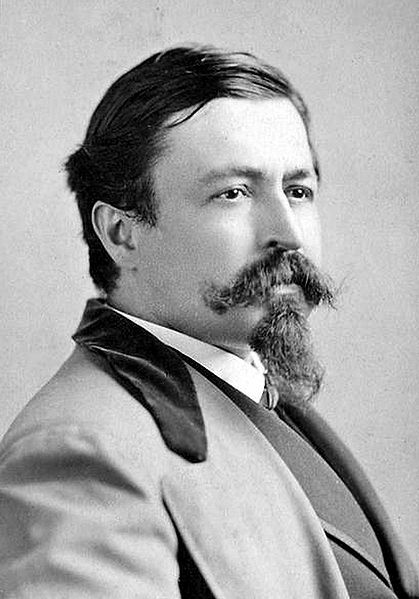 William M. Tweed entered Nast’s arena and dominated three years of his artistic and professional life, beginning in 1869. Something That Will Not Blow Over exposed what Nast perceived as a destructive trinity of Tweed-Irish-Catholic partnership. Nast laid the blame squarely upon all three. The cartoon ran at the climax of his three-year tirade against Tweed. In the center image, an African American hangs lifeless under a lamppost marked with the date of the draft riots. The Colored Orphanage that was destroyed during the 1863 riots once again smolders in the background. A mob bearing raised weapons shout in outrage. To the lower right of the murdered African American, a Roman Catholic cleric faces his flock. His hat designates he is Monsignor or a Bishop. He does not give a blessing to the soul hanging by a rope nor to the dead and injured piling up on the ground. He is not heading off the crowd. This priest is not a figure of comfort. He clutches his crucifix close to his body and his posture, with his head down-turned, face unseen, and his shoulders raised in a hunch, suggest a devious and cowardly role in the midst of the melee. 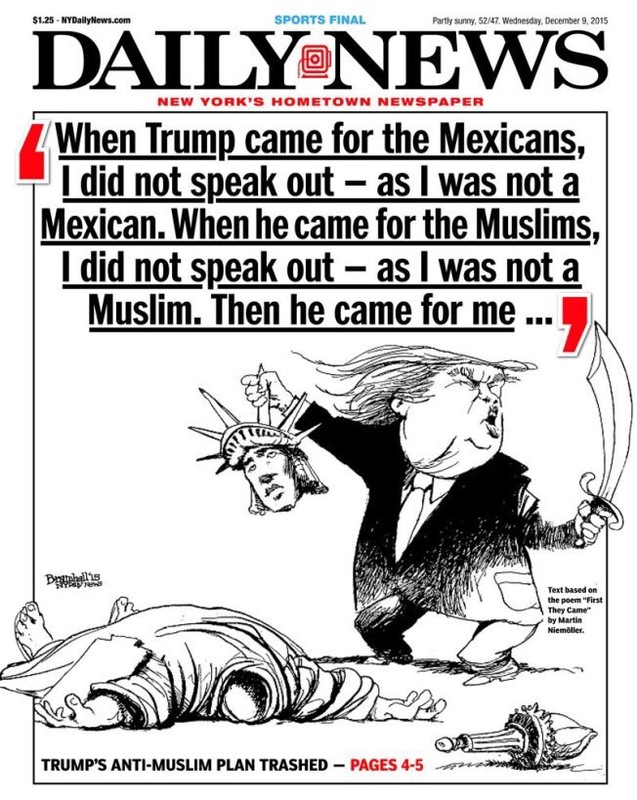 The mob is his congregation, his faithful, and he does nothing to stop their attack. To the right, a diverse group of people walk away from the mob scene. Uncle Sam, a symbol of the federal government, is front and center, but he is withdrawn, either putting away his sword or is second guessing his impulse to draw it forward. The wiser course may be not to engage or incite the mob, but defuse them by walking away. Only the Chinese man, on the right, flees from a sense of fear. The rest of this crowd turns away from the mob, and looks back at the instigators as they do. Their faces and body language show dejection rather than fear. They are not making a hasty retreat. The feathers of a Native American Indian, Kaiser helmets, Italian fedoras, a saucer cap and queue of the Chinese man are all part of Nast’s Republican “come one come all” symbolism used in other cartoons that advocate a utopian vision where different races and cultures can live together in harmony. 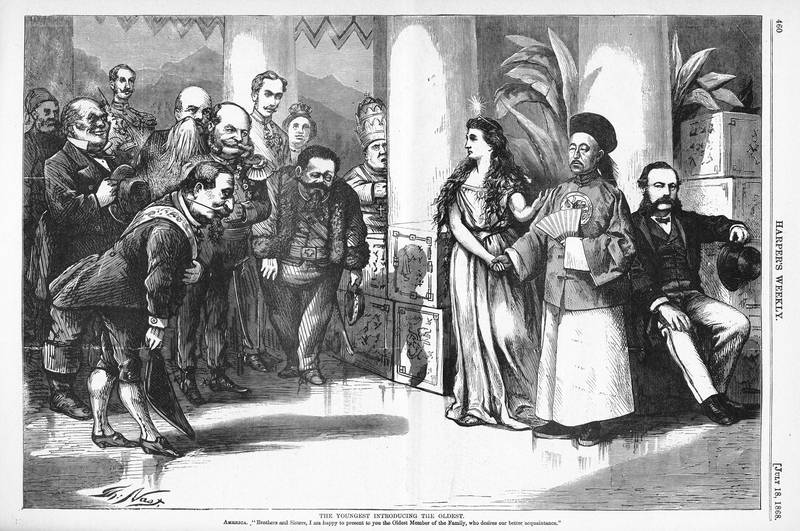 Nast included heads of state, such as a morose Queen Victoria, to help to express his view that the whole world might be ashamed by the Irish-American state of affairs in New York City. A violent outburst like this would never have been allowed to happen in her country. No wonder Victoria looks so dejected. In the back of the crowd to the right, two banners are visible, one reads “Liberal Catholic Dollinger and Hyacinth.” It is important to note that Nast placed a Catholic element on the positive side of his drawing. Ignatius von Döllinger, a progressive Catholic scholar and priest from Nast’s native Bavaria, vehemently and publicly opposed the dogma of papal infallibility. 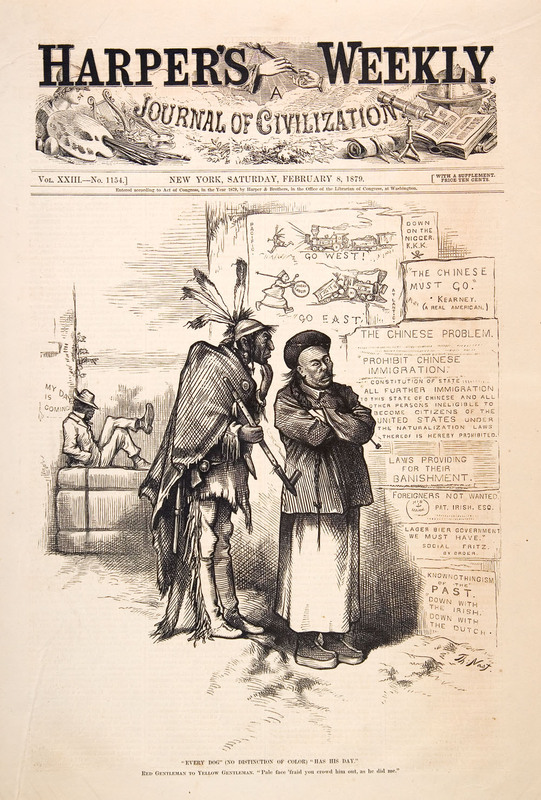 He was excommunicated by the Pope, which raised him to the rank of exalted hero at Harper’s (June 17, 1871) and in several Nast images (July 17, 1871). A courageous, independent thinker was a Catholic to be admired! Only a month before the Orangemen riots, Harper’s had saluted Dollinger’s moral courage and position as moderate Catholic, “Dr. Dollinger declared that the dogma of papal infallibility contradicted both Bible and tradition, and would create interminable conflicts between state and church” (Harper’s June 17, 1871). In Nast’s view, heroes like Dollinger were a rarity. Conservative, ultramontane Catholics set policy in the Vatican. On the left side, the American flag is upside down, a clear signal that the nation is at peril. The overarching statement, “Has no caste, no sect, any rights that respect the infallible ultramontane Roman Irish Catholic is bound to respect” reinforced the widely held Protestant notion that the Irish did not have minds of their owns, nor did they respect any tenets except those preached by the Catholic Church. Directly opposite, a Catholic flag, adorned with the Irish harp, a very Irish looking Tammany Tiger, Nast’s animal symbol for the political power of Tweed’s machine, and the papal standard, fly high over the land. Here, Nast suggests that the menace will become transcontinental – what starts on the East Coast will soon blow westward. Beware California, the Irish Catholics are coming! Public schools are seen crumbling on the Irish side, Nast’s snide reminder of the municipal funds which poured into Catholic schools at the behest of Tweed and at the expense of public interest. To the right, the Protestants must contend with the spires and steeples of Catholic cathedrals, churches, and schools supported by tax dollars. Other smaller scenes show the series of events that led up to the Orangemen’s riot. The top right image’s theme is honor or lack thereof. King William III, Prince of Orange, with two police escorts, shows his written permission to parade to St. Patrick, the patron saint of Irish Catholics. It is not offered meekly, slipped across the floor as Tweed has done with his documentation (see lower left and right images). King William’s authorization is placed on a pedestal. William is trying to reason as one leader to another. He offers a compromise – a quid pro quo – promising that the Protestants will abandon their parade if the Catholics will do the same. He asks for fairness as if to say, we will give up our rights, but will you? Despite any animosity, he is approaching his adversary as an equal. Nast does not extend any artistic courtesy toward St.Patrick. 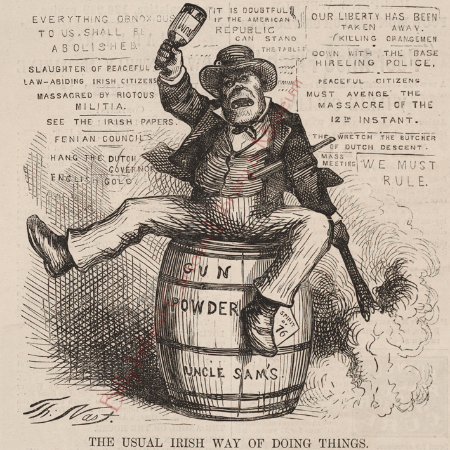 Nast laid an array of stereotypes upon St. Patrick. Nast creates an obstinate figure who will not listen to reason. Despite his higher position he delivers his “Nivir” in heavy Irish brogue. Although he wears the robe of Catholic hierarchy, he looks like an ape. His attitude is anything but saintly. Hands on hips, exposing his vestments and crucifix, he turns away from William, according him no respect. Harper’s represented two perspectives in the form of prose. The author(s) are unknown, but they were likely written by the editorial staff. 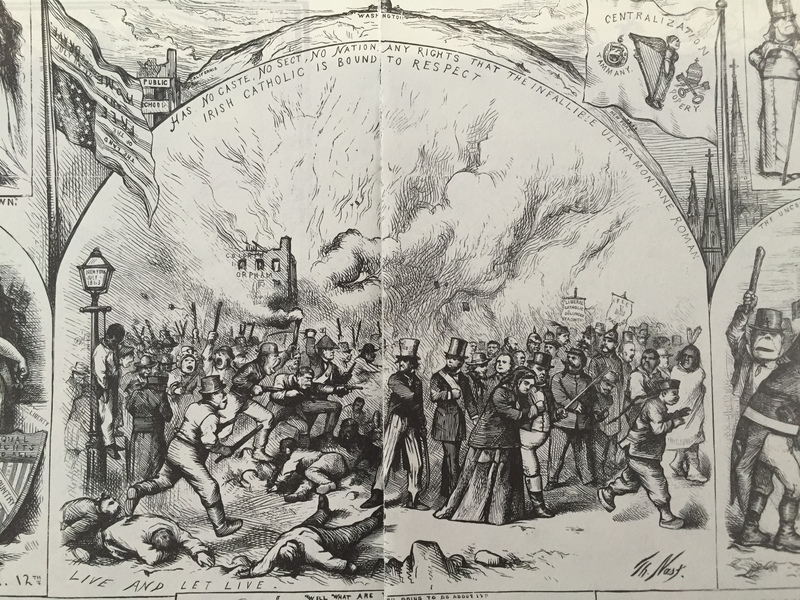 At the top left of the image, Columbia places laurels on the heads of New York City policemen, presumably some of whom are Irish, for their valor and adherence to law during the riots. Columbia appears as Nast’s voice. Columbia freely rewards valor, shames cowardice, and highlights hypocrisy. She does not suffer fools, particularly Tammany fools, lightly. 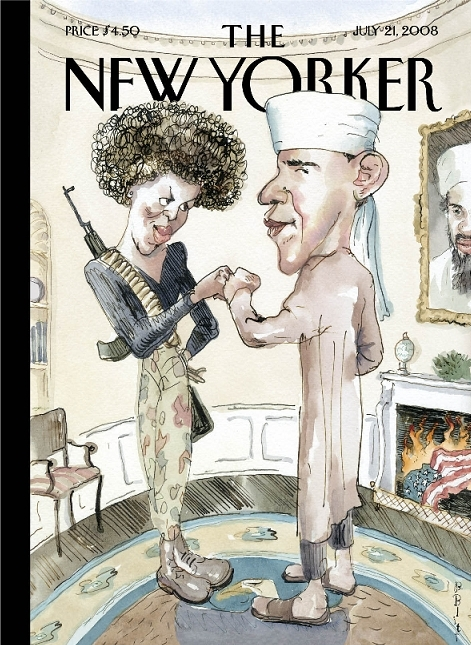 Put into service by Nast, she will do his bidding, rising to a noble call to defend her country without hesitation. While these vignettes are important,Nast’s deployment of Columbia on the issue’s cover image, Bravo Bravo, deserves special attention. 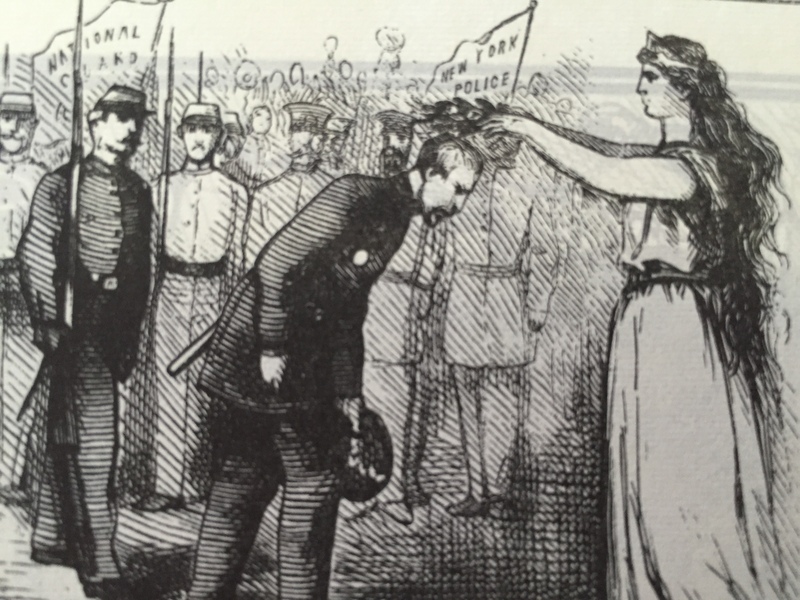 Complimenting Harper’s reports of Irish policemen serving valiently during the riots, Columbia places laurels upon the heads of the police who aimed to keep the peace between the warring factions. Are these public servants Irish? They could be. 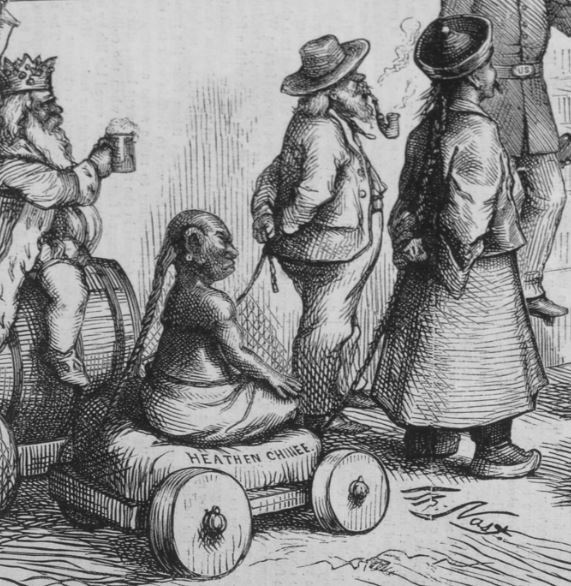 If so, the image defies the allegation by some scholars that Nast always drew the Irish as beasts and thugs. It is easy to pick out the Irish that Nast criticizes. 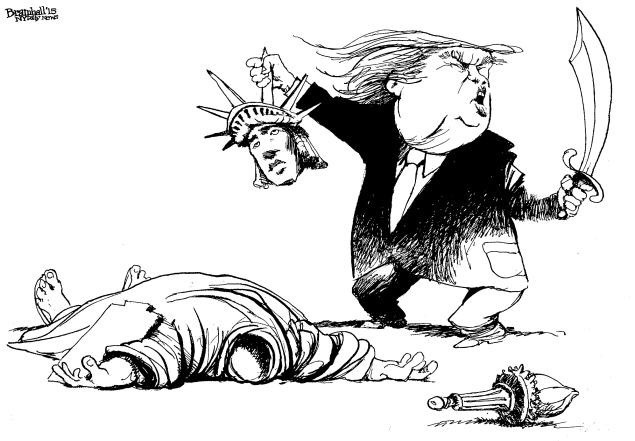 He uses stereotype and caricature to call out their crimes. How does Nast show an Irishman in a favorable light? Policemen in uniform would not be wearing the waistcoat or a top hat. 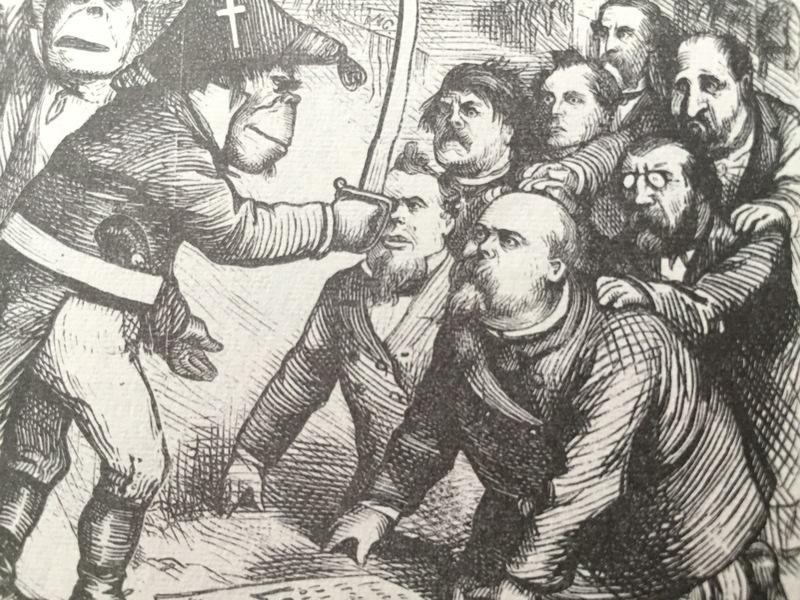 In the line of civic duty, It could be argued that whenNast drew Irish policeman, he drew them to look like any other American from a European ancestry. It is easy to prove a negative. Far more difficult to spot the everyday ethnicity, including Irish, whom Nast felt behaved admirably.